Getting advance copies of games is a wonderful thing; it gives an element of exclusivity to being a writer and gives an edge to the site in general. Sometimes though, you acquire a game to review that you wish to animatedly talk to people about, and no one has heard of it for one reason or another. So with that, I got to play (and have no one to talk to about) a little game by Level-5 called Little Battlers eXperience (LBX) for Nintendo 3DS. It’s difficult to believe but if you watch Nintendo Directs, you would have already seen this game, or would have at least heard of it. But, that being said, LBX is already a pretty big deal in America / Japan; then again, they have the franchise supplemented with toys and a cartoon series, which we do not have in the UK (to my knowledge) but follows the same narrative as the game. The last that EU fans would have seen of it was the showing of some of the game’s features during Nintendo’s Treehouse @ E3 coverage. The world of LBX is set within a kind of future Earth in which there is a growing trend among kids (and some adults) for battling each other with small robot toys called LBX. These battles are often played out in portable arenas that deploy from small cubes to avoid damage to people or property and are hugely popular. The story of LBX is of a young boy called Van that acquires an LBX in suspicious circumstances and, with his friends, becomes embroiled in a deep plot stretching as far as the government of Japan itself. I know what you’re thinking, and yes, this is pretty much a typical anime plot from the ground up (in fact, I keep finding aspects of different anime embedded in the narrative). So far, the plot is engaging and ridiculous enough to keep me interested, and anyone who has even a passing interest in storylines in games will find enough to want to progress. In terms of gameplay, LBX is both amazingly simple and terrifyingly complex to get to grips with. However, I will need to separate the combat from the rest of the game just for the sheer difference between the two. The main chunk of the game is that of your everyday JRPG, exploration and side quests. The city is divided up into different areas to serenely explore with people everywhere to talk to and help out from time to time, although littered among them are people looking for a battle (they’re a different colour on the map, so easy to avoid if you’re in a hurry). In the main menu there’s a bulletin board that allows you to take on quests for people in return for money or other prizes. These can be anything from battles, to fetch quests, to just generally helping them out by talking to them, and the variety in these not only is diverse enough to keep interest but also all give a welcome digression from the plot. The combat is a different animal. Played out in the isolated arenas, they are often a battle for survival. 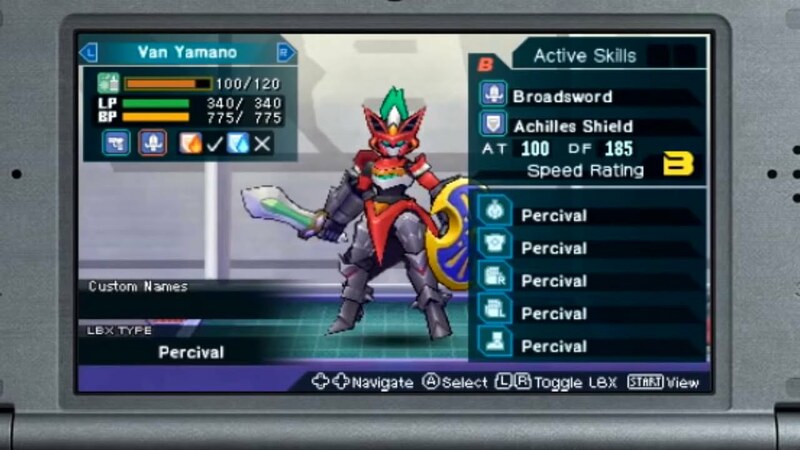 Each LBX controls differently, but they all have attacks, special attacks (that must be charged), a dash and a block. All of these movements (except block) use energy that restores itself when immobile, but means that you can’t just continuously attack or dash without incurring penalties. Given the diversity in the types of LBX that can be played, the battles are always fresh, with the necessity to change tactics depending on what LBX you are battling (for instance, needing to close the gap on the sniper type as soon as possible). Or, in the advent of 3-on-3, the player can alter the primary AI tactics for your companions to aid your team in battle. Now, I’ll say here that I am biased when it comes to anime-based aesthetics in gaming, but I love the look and sound of this game. LBX has a beautifully simple cartoon art style (no doubt intended to create a kind of synchronicity with the cartoon series) and a wonderful isometric viewpoint giving the player the impression of a diorama playset that they are manipulating (this contrasts with the more dynamic 3rd person camera during battles, once again giving the combat its own area to shine in). The characters are all typical anime tropes, some even laughably so (if you fancy seeing what I mean, Google “LBX Hanz”, but I won’t spoil it here), but yet they are all endearing to the player (if not entirely three-dimensional). The game’s soundtrack is, once again, simple but effective and full of some really good music. In short, LBX has all the polish that gamers have come to expect from Level-5 and then some. So, should you buy Little Battlers eXperience? This doesn’t really have a simple answer. If you have a hole in your current gaming life that can only be filled with a game like Pokemon, Digimon or that ilk, then LBX is the perfect fit. However, I acknowledge that it will feel derivative to some players of those two franchises. Personally speaking, I love the game for taking the “creature-capture” genre and refining it into a lot simpler set-up and with a far better story than most of its rivals. It feels wonderfully flexible without compromising on simplicity and is a worthy addition to any gamers collection, not just the kids. Battle on! So, will you be getting LBX? Let us know in the comments or on Twitter (@reuthegamer). Finally, thank you to Nintendo for supplying us with an advance copy of LBX to review. 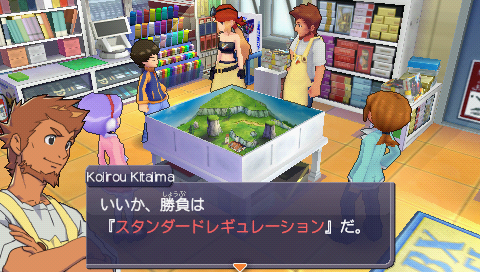 Little Battlers eXperience is released for Nintendo 3DS both in stores and on Nintendo 3DS eShop on September 4th.